OdorXit Magic - Eliminate Airborne Odors For Good! OdorXit Magic Is Freshly Scented and absorbs & neutralizes odors in the air or on the go. Magic is a clear, nearly odorless liquid that absorbs smells good or bad like a sponge for up to two weeks. And like a sponge, when it becomes saturated it stops working. You can keep it working by...spraying more product. This process can be extended forever if necessary. Magic often eliminates non-recurring odor permanently. It contains no bacteria, enzymes, volatile solvents, perfumes or masking agents. Magic is a totally different recipe than our OdorXit Concentrate product. 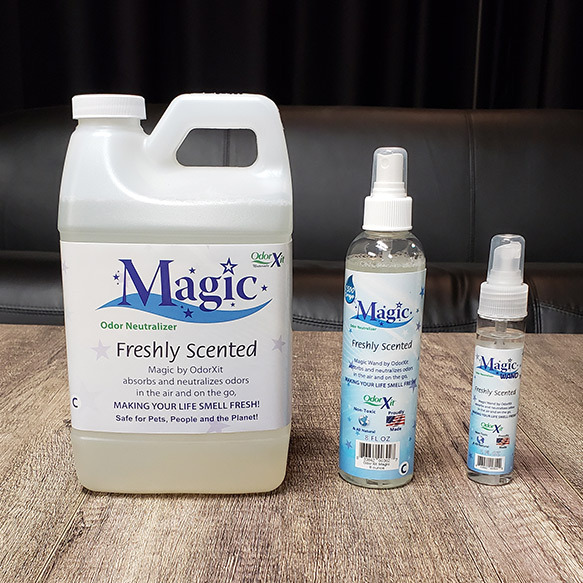 Magic by OdorXit neutralizer is a blend of non staining, non-toxic, biodegradable essential extracts that absorb and destroy malodor gasses on contact, leaving the air smelling fresh and clean. No dilution or mixing is necessary and no perfume fragrances are left behind.